A phrase coined by the Navy’s Seabee construction battalion, “Can Do!” takes just a second to say but is weighted with implication. It can be a declaration, a response to a question or command, a promise to yourself. In Storti’s case, it’s all three. Storti will say without hesitation that as a Seabee — and now as a Seabee veteran — he gets any and all work done without hesitation. The catchphrase has become part of his personality. It bleeds into his passion for various projects — one that, most notably, has consumed more than a decade of his life. In mid-July, the 69-year-old Willow Grove resident watched a crane assemble slabs of metal to bolt and weld the massive veterans memorial sculpture in Upper Moreland that he has dreamed of creating since 2004. 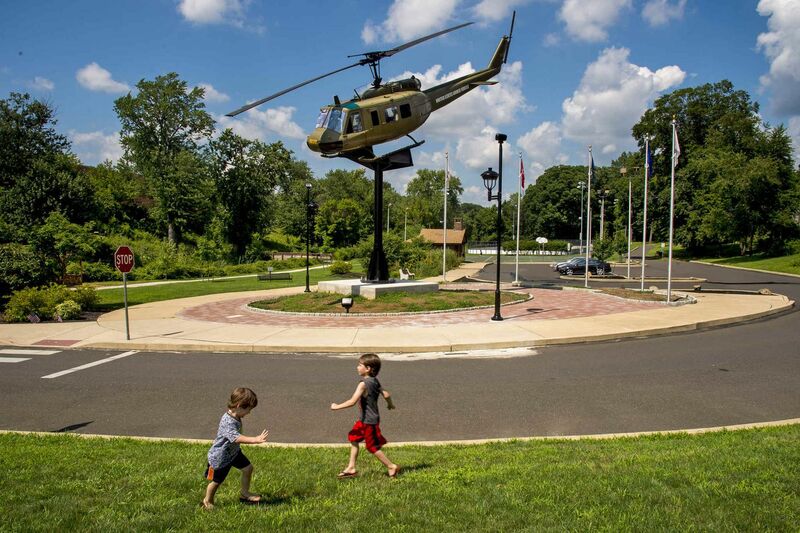 TOM GRALISH / STAFF PHOTOGRAPHERA Vietnam War-era Bell UH-1 Iroquois Huey helicopter in Willow Grove’s Veterans Memorial Park. Ralph Storti, a Vietnam War veteran, spent 14 years working to bring to life his vision of the memorial that would honor members of all branches of the armed services. He had been waiting for that moment — a crowning moment of “Can Do!” — for 14 years. But the story behind the motto goes back further than that. Those two words saw him through duty in Da Nang at the height of the Vietnam War, where he was a heavy-equipment mechanic for the Seabees. It got Storti back to Warminster in 1970 after spending a year in Vietnam. And it’s the motto that has kept him and a small team of friends, one of whom is an Upper Moreland commissioner, focused on their vision of crafting a memorial to honor veterans from all five branches of the U.S. military. The memorial, Storti imagined, would be topped with a helicopter, a symbol he sees as inclusive of all military branches. 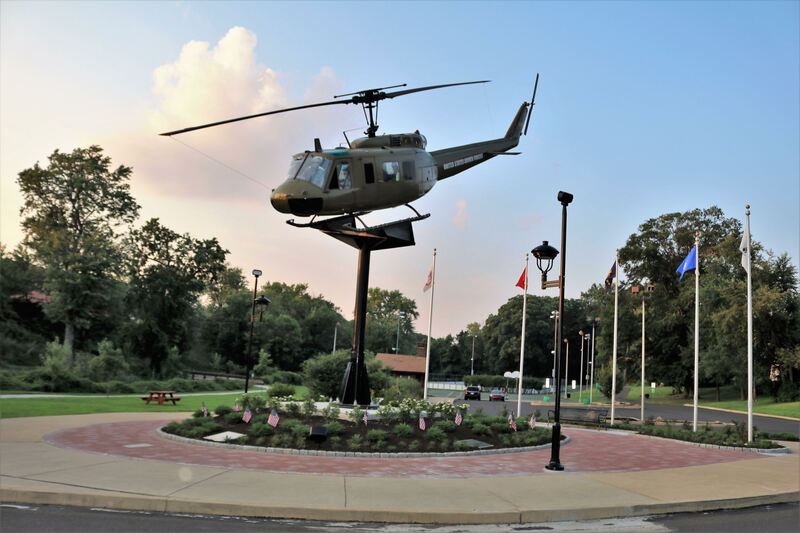 Storti, who suffers from health conditions as a result of exposure to Agent Orange during the war, did, however, have one stipulation: He wanted a helicopter used in the Vietnam War for the memorial. TOM GRALISH / STAFF PHOTOGRAPHERA life-size contemporary photograph of Ralph Storti is in the cockpit of the Huey helicopter. Other community members are pictured in other windows of the chopper. He ended up getting just that: a helicopter bought by the U.S. Army for use during the Vietnam War for a 1966 to 1967 tour, then a 1968 to 1970 tour. The helicopter, now stripped of its engine and transmission, weighs about 3,000 pounds. He remembers the first time he flew in a helicopter. It was 1969, and he was in Vietnam. He was 18 or 19. He recalls how the helicopter lurched straight up, the rotors spinning noisily above his head. For the memorial, Storti and his volunteer group — friends working in commercial development, insurance sales, real estate, landscaping, and the steel industry — got a ramshackle Bell helicopter, popularly nicknamed “Huey,” after spending eight years on a military equipment surplus wait list. Using a lowboy trailer, they drove the helicopter from Niagara Falls to Pennsylvania, spent two more years rounding up parts for repairs, then bought a manual online to figure out how to put the vintage aircraft together. “Ralph is the person who came up with the idea and dreamed it,” said Kip McFatridge, Upper Moreland’s Ward 5 commissioner, who purchased the helicopter manual and helped assemble the aircraft with Bob Mathers, a real estate agent in Willow Grove. 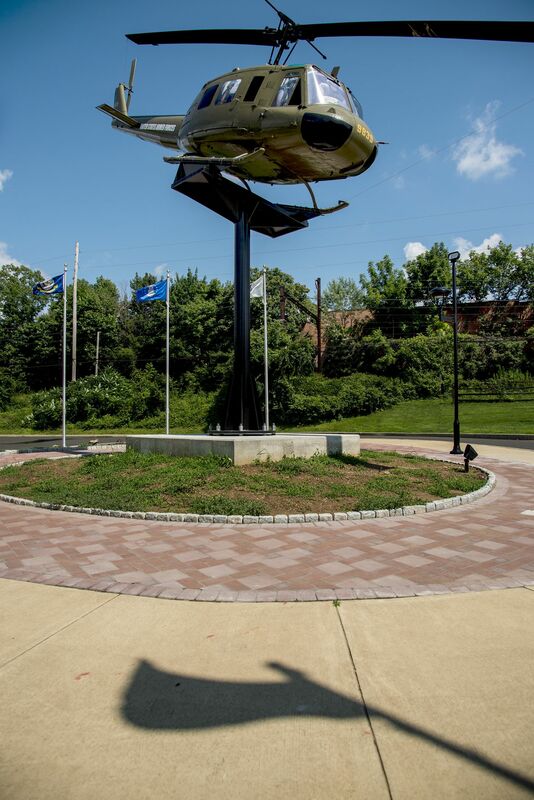 In the last two weeks, a crane set the helicopter, recently repainted a shade of muddy green by Storti and his team, atop a 15-foot steel pole at Willow Grove’s Veterans Memorial Park, 220 Mineral Ave. in Upper Moreland, which has served as a site to honor veterans since the mid-1940s. Storti’s group had little money to fund the 30-foot memorial, which he estimated cost about $400,000 in private funds to complete. But it got done, he says, thanks to generous donors. Bruce Goodman, a developer who has owned Jenkintown-based Goodman Properties for 40 years, said he recommended some of his contractors, including electricians and landscapers, to work on the project at a steep discount. Goodman then footed a large portion of the bill. 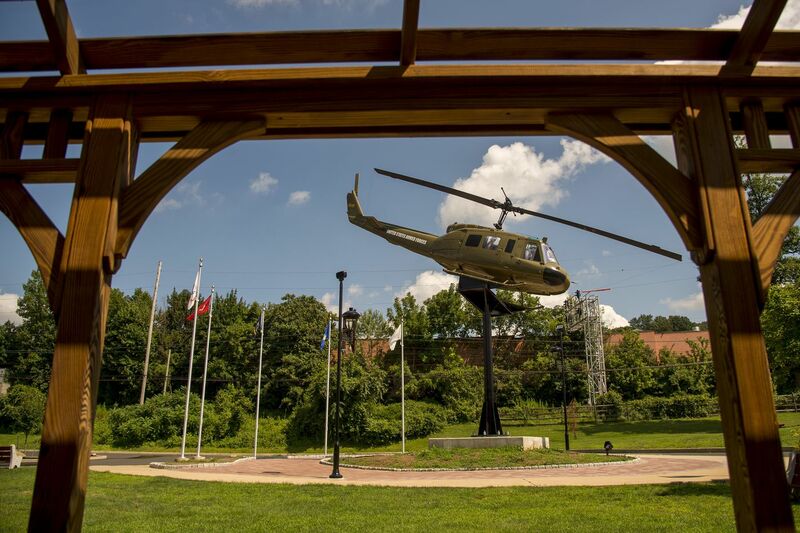 The steel company O’Rourke & Sons hauled the helicopter down from Niagara Falls, stored it on the firm’s property for nearly two years, and helped assemble the memorial, Storti said. An American flag casts a shadow, flying along with flags representing all five branches of the U.S. military. On a recent July afternoon, Storti gazed at the helicopter, its splayed feet bolted to a flat sheet of black steel tilted in such a way that made the helicopter look as if it were in mid-flight. 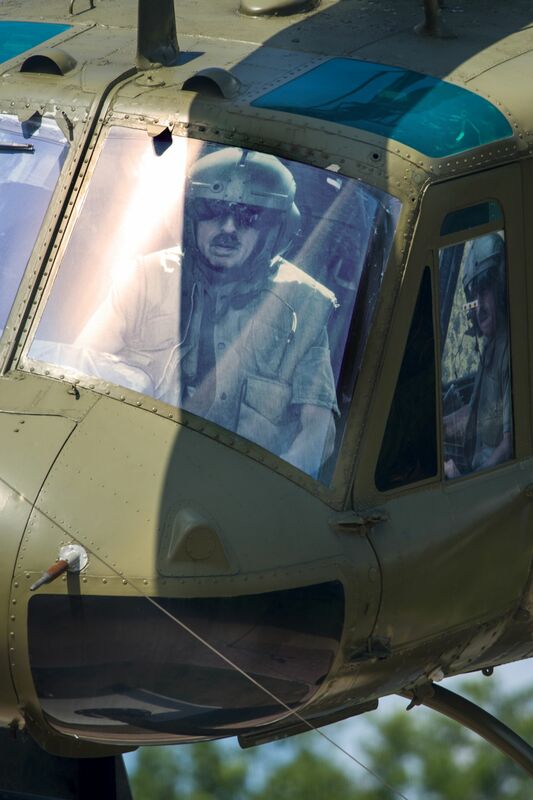 Stuck to the inside of the helicopter’s windshield were cut-out, blown-up photos of the people who helped the memorial come to life: Storti, McFatridge, Young, and Mathers. A photo of Storti sat in the pilot’s seat. Storti says he has received countless calls and messages from local residents complimenting the memorial. He said with pride that the national headquarters of the Veterans of Foreign Wars is interested in learning how the project came together. He visits the memorial every day, and calls this hulking structure a dream that’s finally come to life. TOM GRALISH / STAFF PHOTOGRAPHERNoah (left, 3) and Nate Kolsky, 5, pretend to be airplanes, playing near the memorial. © 2018 Willow Grove Veterans Memorial. All Rights Reserved.